WASHINGTON _ Katie Ledecky didn’t know Bryce Harper would wear her swim cap during the Washington Nationals’ division-clinching celebration last weekend, but the champion Olympic swimmer is glad he found some use for it. Harper used one of Ledecky’s caps to shield his head from champagne Saturday when the Nationals celebrated winning the NL East. 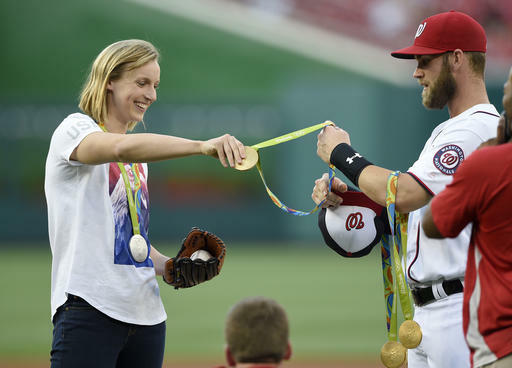 The reigning NL MVP was a glorified medal holder for Ledecky when she threw out the ceremonial first pitch at Nationals Park, and that got him a gift. Ledecky, a 19-year-old native of Bethesda, Maryland, won four gold medals and one silver medal in Rio, shattering the world record in the 800-meter freestyle. She talked with Harper and several Washington players Aug. 25 when she threw out the first pitch and say they expressed how big of fans of hers they were. Harper took it a step further.